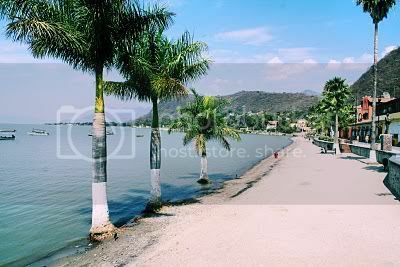 Browse > Home / Love the Beach, Love the Moutains, Love Lake Chapala? Have it All! You May Be Able to Have It All! Here’s a quote I found on line. "My wife and I retired in 2003 at the ages of 54 and 53, respectively. We moved to San Antonio Tlayacapan on Lake Chapala in Mexico in 2005.Two years ago, we bought a house in La Manzanilla del Mar on the Tenacatita Bay, just a three-minute walk from the beach. It is now our primary residence. We have also kept our $320-per-month, two-bedroom rental in Chapala. We sublet the house to an American snowbird for 6 ½ months a year. The rent covers more than 10 months of our costs each year. We think that we are living the ideal life, splitting our time between the ocean and the largest lake in Mexico." -Jonathan P.
You may not be able to have a mansion at each place, but for some people having several nice places makes for a more stimulating, interesting, lively lifestyle. I’m personally not there yet, but hope to be. I have a home in North Texas and a home here at Lake Chapala. I live at Lake Chapala and just visit my Texas home. I’m always glad to get to North American and I’m always glad to return here to Lake Chapala. Next, even though we’re just a 5-hour drive from Puerto Vallarta and less to other smaller beach towns like Guayabitos I think it would be great to have a home on or near the beach too. More and more of our clients are opting for this lifestyle if they have the financial means to do both. The below photo is the beach in downtown Chapala so you may not even want to consider Vallarta and the other near by Pacific beaches. What's your opinion? What's your dream? Share it with us in the comment's section below. Remember our Exclusive Buyers’ Only Realtors here at ChapalaClub.com are all about making Your dreams come true if they might involve a home here in the area around Lake Chapala. Mexico. So, if you want to know more about living, working, and playing at Lake Chapala (Chapala, Ajijic, San Antonio Tlayacapan, San Juan Cosala, Jocotepec or any of the developments, towns or villages along the North shore just drop me an e mail to Sid@ChapalaClub.com. Please put "Lake Chapala Info" in the subject line and it will help me find your e-mail quickly so I can respond to you right away. Afraid You’ll Miss North America? You May Be Able to Have It All ! What’s Up at the Lakeside Little Theatre? About 11 year ago we spent 3 weeks at the Nino hotel in lake Chapala which we heard is no longer there. Loved it there. Would love to go back but hear so much how dangerous Mexico is today. Many have told us not to go. Kidnappings and murders. What is your reply? Thanks for your comment. There may be more crime in Mexico than 11 years ago, but the Lake Chapala area has been affected very little. There’s only been as far as I know only 2 North American murdered in the last 6 years that I’m aware of. Two arrests in the most recent one have been made. Apparently the victim knew the perpetrators. A Chapala police officer was also killed this year. While any taking of life is sad the relative safety of the Lake Chapala area remains very high. The Chapala Police have a reputation in the North American Community of being very responsive to what crime there is in the area. All the North Americans I know here feel very safe (like always) while concerned about the violence we hear about in other areas of Mexico and our home countries as well. BY the way the Nido hotel building is still there and was bought by the government and is now the seat of the Chapala Government. You should come back and I think you will be astonished in the many positive changes since you last visited. The area is more beautiful than ever, the home prices are still very low, and we have many more shops, new shopping centers, and even a new 5 screen movie complex. The British Society Friends meet very informally 1st Saturday of the month at 1pm. Manix, Ocampo, 765-4786 the last I knew. To call from the USA you would call 011 52 376 765 – 4786. Maureen. The British Society also has a regular monthly meeting is at Manix Restaurant, Ocampo 57 in Ajijic. Members and guests choose from two full meals or a light meal of salad and dessert. Call Alicia McNiff at (376) 765-4786 or President Ceri Dando at cpdando200@yahoo.com if you wish to attend. Love the Texas sayings…….I even think I’lluse a couple of them myself…….thanks for the great newsletters each week with all your useful info. Hi Gail, Thanks for your nice comments. Please feel free to use the folk wisdom contained within these Texas sayings. Some of them were adopted in Texas from quotes of Will Rogers I’ve recently learned. Just a little fun, but a clever shorthand way of expressing words of folk wisdom.